SAGE developed a curriculum called “Farming in the Watershed” that engages children with the farmers and landscape of the unique, 18-acre Sunol AgPark through a variety of hands-on activities. The curriculum has 18 lessons in 3 units which were all tied to California State Standards at the time. The lessons and units have provided the basis for SAGE’s Sunol AgPark Education Programs. The Sunol AgPark is a dynamic outdoor environment that offers San Francisco Bay Area students a unique opportunity to learn about sustainable agriculture in the context of a regionally- important watershed. The Sunol AgPark was created from the mutual interest of SAGE and the SFPUC in developing an entity that integrates sustainable agriculture, natural resource stewardship, and public education about the Sunol Valley. 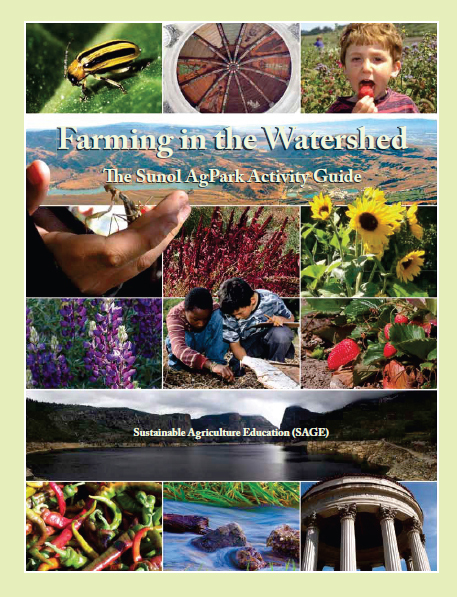 Farming in the Watershed is a curriculum that introduces Sunol AgPark visitors to the concept of stewardship, and provides a framework for on-site experiential education. 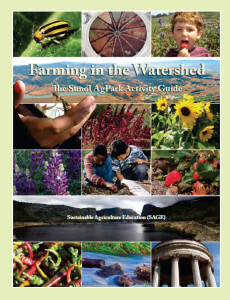 The curriculum investigates the unique resources of the AgPark site, including the historic Sunol Water Temple, the Arroyo de la Laguna creek, and three working organic farms. The confluence of these and other diverse elements at the AgPark encourage student inquiry into the relationship between farming, food, water, and culture. Farming in the Watershed was designed to stimulate students’ visions of a healthy, just, and sustainable future by challenging them to explore their roles as stewards—of their own health, their watersheds, and their communities. This unit explores the relationship between the Sunol Valley’s human inhabitants and the landscape over time. Activities include: drawing the Sunol Water Temple, building a model water system, and investigating the history of AgPark crops. This unit explores the connections between healthy farms, healthy food, and healthy communities, focusing on the AgPark farms. Activities include interviewing a farmer, observing insect diversity, and helping a farmer. This unit explores the relationship between the AgPark and the surrounding environment. Activities include building a model watershed, exploring creek diversity, and taking soil samples.